"Kyocera is looking to regain a foothold in the US smartphone market, and curiously enough, it's doing so by catering to niche audiences. 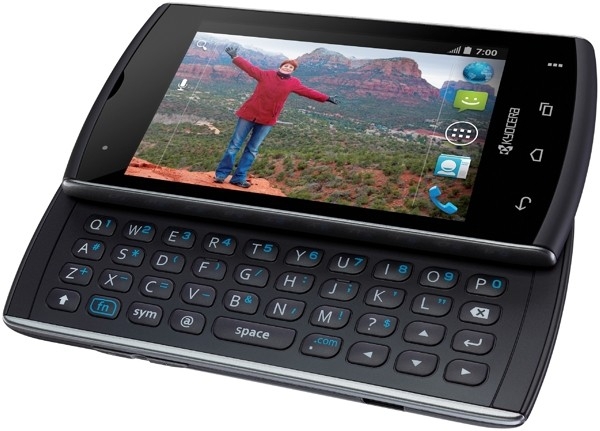 First we saw the Hydro, a waterproof handset, and alongside it is the Rise, which features a sliding QWERTY keyboard." The Kyocera Rise should be an inexpensive phone with the latest version of Android for people who mainly want to do texting. It's CDMA so you can look for it on Sprint or Verizon. It has a 3.5" 320x480 resolution IPS LCD screen, 512MB of RAM, 2GB of built-in storage and it comes with a 2GB MicroSD card. It has a single-core 1GHz Snapdragon S2 processor that should feel very fast especially with such a low screen resolution. It also has a 1500mAH battery that should provide plenty of juice to get you through the day on this device. We don't know which carrier it will go to but my guess would be Sprint. It's great to see Kyocera ready to ship the Rise with Android 4.0 but it's really too bad they gave it a screen that's so small and has such a low resolution. Really, I can't believe any manufacturer would release any phone with a lower screen resolution than 480x800. At least they put the needed system buttons on the phone so you don't need to waste more of the screen just to show the system buttons. The keyboard looks like the keys are nicely spaced and I always like having an inverted T layout for the arrow keys but I'm also a fan of a 5 row keyboard so you don't need to use a function button to get numbers. Are you looking for a lean, mean, texting machine? Are you OK with the screen size and resolution? Check out the hands-on video after the break!